It is encouraging to see the number of people engaging in meaningful dialogue about important local issues through the Letters page of the Chronicle. Sadly, too often these letters include references to failed attempts to work with Wanganui District Council on strategies that work with nature instead of against it. For some reason, our Council appears stuck in the past on many issues of infrastructure and economic development. From most accounts, the 1950s were a great time to be alive, but in many cases ‘50s thinking no longer applies. Small swale and rain garden. One of those water management strategies – swales – has been in use for decades in some places around the world. A swale is a long, narrow earthwork that runs perpendicular to slope. They slow the flow of surface runoff and facilitate infiltration into the ground. They are perfectly level, unlike ditches, which are sloped to drain water away like a river. Water in a swale soaks into the ground instead of running over it. A carefully constructed swale includes a level-sill spillway that gently allows it to be overtopped in a controlled manner in the event of extreme rain. The use of swales is the type of win-win-win situation I write about in this column because it: 1) reduces stream and river levels during flood events; 2) increases groundwater reserves that can be called upon during periods of drought; and, 3) significantly reduces the overall cost of infrastructure. Eco-thrifty at its best. For example, two years ago I was asked to consult on a proposed residential development in Kaiwhaiki that had significant drainage problems. I was told the 10-year-old quote to ‘solve’ the problem the ‘old way’ using pipes and culverts was for half a million dollars. After picking my jaw up off the floor, I told them that good eco-design, which would include cluster housing and the use of swales, would significantly slash that price. WDC Chief Planner, Jonathan Barrett, appeared supportive of those ideas during one meeting held at Council. 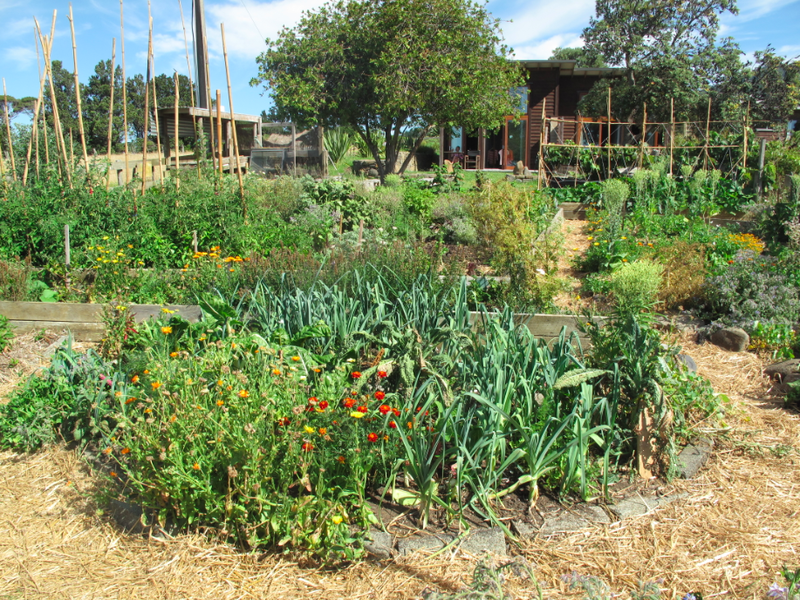 The other strategy promoted by Kritzo – and praised by Chronicle assistant editor, Anna Wallis – is the use of rain gardens. A common use of rain gardens is to absorb and filter runoff from new parking lots or other such impermeable surfaces. In this way, rain gardens function like wetlands: sponging up excess water and cleaning it through natural processes. 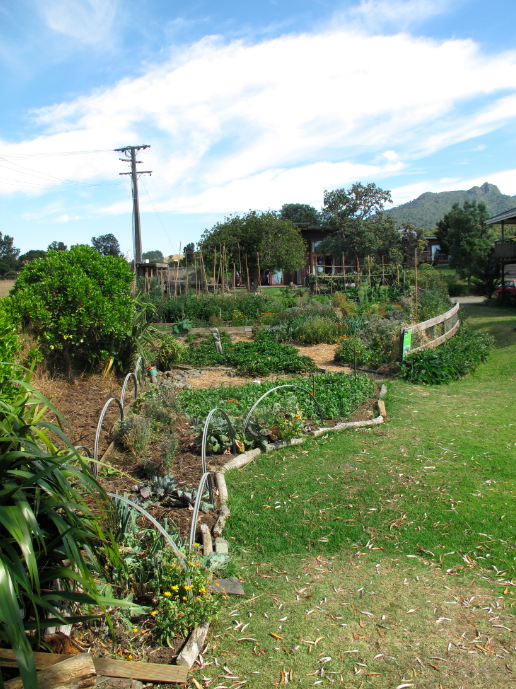 A series of mini-swales and vege gardens make up this garden. I first learned about rain gardens in 2005 while taking a certificate programme in the States on Organic Land Care. Shortly thereafter I advised a school to install rain gardens in a number of locations where they had persistent drainage problems. This was particularly meaningful in the context of the school because it became a relevant learning experience for students. In 2009, while living in Raglan, I built a small management system to control an excess of runoff coming from the roof of a newly built outdoor kitchen at a campground. The system consisted of a swale, a level-sill spillway, and a rain garden. 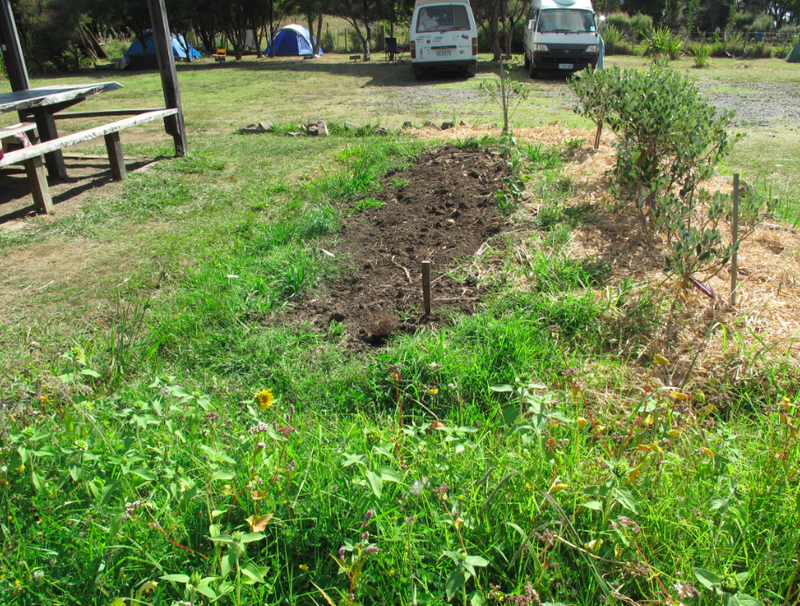 We planted the swale with feijoa trees and the rain garden with plants that tolerate periods of wet and dry. Swales and vege gardens soak up water and keep it from flooding this lawn. While in Raglan, I also used swales as a metaphor for eco-design during a Pecha Kucha night, where artists and designers share their work through 20 slides with narration of 20 seconds per slide. That presentation, “Thinking Like a Swale,” became the inspiration for a programme I offered at the Josephite Retreat Centre earlier this year to acknowledge the UN year of water. Hopefully, when River Week 2014 comes around next year, I’ll get a chance to present it again to compliment and support the education efforts Kritzo has already made in the community. Us ‘swale-thinkers’ gotta stick together. It’s a watershed out there.